If you go on a short holiday then it should be pretty easy to manage your holiday money. It isn’t too hard to track how quickly your foreign currency is running out when you are only abroad for a week or two. If you are going on holiday for a number of months then it becomes a bit harder. When I recently went on holiday for three months I thought being able to record my available currency in the form of a burn down chart would be a useful thing to do. I ended up creating an excel spreadsheet which when filled in gave me three lines on a graph. The first straight line (pink) goes down from the total amount of foreign currency on the first day of my holiday to 0 on the last day of my currency. 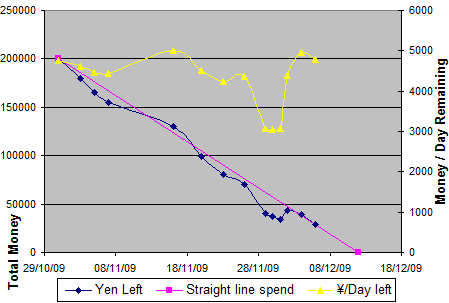 This line shows where my currency reserves should be on average each day in order to spend all the money I took with me. The second line (blue) is the actual amount of foreign currency that I have left. A few times a week I would count up how much money I had left, and enter the data into the Excel spreadsheet. This would then update the second line. If this line is above the straight line then I’m under spending (on average), if the line is above the straight line then I’m over spending. The concept of under or over spending is of course ‘on average’. There may be good reasons why your spending during your holiday might be unevenly spread. The third line (yellow) is plotted against the axis on the right of the chart. This shows how much currency I have left per day on average. To make it easier to see how to use the spread sheet I have put a load of example data in the yellow cells. When you understand it you will have to remove the example data and enter your real data. Don’t delete anything in the red cells as these cells contain the formulas which will make it all work. I have put comments in cells A2, B2, H2, I2 and I3 explaining what you need to put into these cells to get the spread sheet setup for your own holiday. Then all you need to do is update it every few days and you’ll be able to see how fast your holiday money is burning down. Download the holiday money spreadsheet from here (12kb). This entry was posted on Tuesday, March 2nd, 2010 at 7:32 am and is filed under Life. You can follow any responses to this entry through the RSS 2.0 feed. You can leave a response, or trackback from your own site.